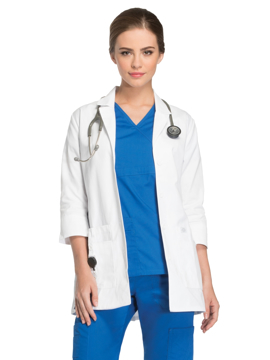 Contemporary fit button-front lab coat features a notched collar and ¾ sleeves with side vents that can be folded up as cuffs. Also featured are four patch pockets (one with utility strap and D-ring), back darts and a center back belt for shaping. Center back length: 30". 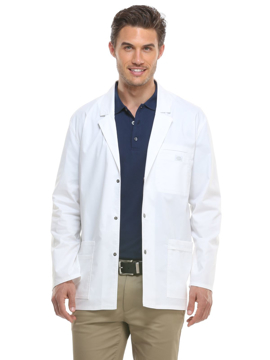 Men’s fit lab coat features a snap-front closure and multi-needle topstitching. Also featured are five pockets, including two patch pockets, a chest pocket, a cell phone pocket and a multi-sectional pocket. A utility loop, a back yoke and a kick pleat complete the look. Center back length: 31".